The coming together of journalists' organizations and media houses is a lesson in democracy. In the state of Tamil Nadu in India, there is hardly any conversation about the way television channels are distributed to homes; Tamil Nadu Arasu Cable Television Corporation Limited (TACTV), a state-controlled digital distribution network controls almost 70 per cent of the nearly-1.75-crore television homes across the state. Sun Network-controlled Sumangali Cable Vision (SCV) which dominated the distribution throughout the state for two decades now controls just 10 per cent of the Chennai city market, which is about five lakh TV homes. Jayalalithaa, the former chief minister of Tamil Nadu, championed the democratization of the distribution of television channels during 2011-12 by arming the TACTV network with “near- absolute” powers; this has given space for several independent news channels to spring in a market dominated by news channels which are run by either political parties themselves or people close to political parties. However, the instrument of democratization of distribution became a tool for intimidation and spread an atmosphere of fear in the newsrooms since 2015; the anti-liquor protests in the build-up to the 2016 Assembly elections were telecast by the Kalanithi Maran-owned Sun News channel and the Pattali Makkal Katchi-backed Makkal TV. The first “black outs” on Arasu Cable TV network targeted these two news TV channels. 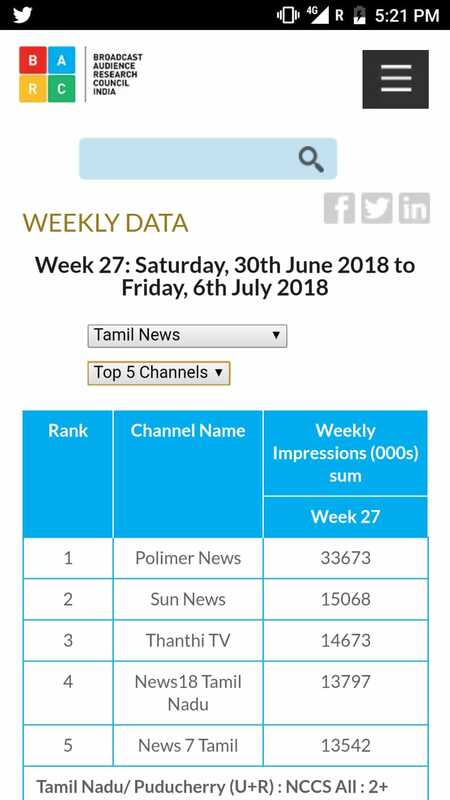 While Sun News suffered black outs when they telecast anti-liquor protests, Makkal TV was relocated from the 8th spot to 77th spot on Arasu Cable Network. This made the channel inaccessible in several lakhs of TV homes. The 2016 Assembly elections returned Jayalalithaa to power. The black-outs of Sun News and Makkal TV continued. Jayalalithaa’s demise worsened the situation for news TV channels in the state; Puthiya Thalaimurai TV organized a debate on the growing anti-government protests on June 9, 2018 in Coimbatore; The news channel was slapped with a case under Sections 153A and 505 of the Indian Penal Code and also under a provision of a state act relating to damage or loss caused to property, for remarks made by guests participating in the discussion programme. The Arasu Cable TV Corporation pushed the Puthiya Thalaimurai TV down from the 124th to the 499th slot, removed it in some places from the Tamil cluster of channels, and even regrouped it with channels in other languages. This is not an isolated instance. Several other news channels such as Thanthi TV, News 7, Sathiyam TV, Jaya News, News 18 Tamil Nadu, Captain TV, Kalaignar Seithigal, Cauvery News have faced black-outs, or other forms of deliberate ‘overgain’ distortion, for periods varying from a day to a couple of months at the hands of Arasu Cable. Jaya News which is named after Jayalalithaa in the above list may come as a surprise; Jaya Network clearly sided with the TTV Dhinakaran camp, a breakaway faction of the ruling AIADMK, since September 2017; the channel started giving prominence to anti-government protests; whenever there is a major anti-government news, the visibility of the channel is distorted. The management claims that they are not visible in many parts of the state as they are illegally blocked on Arasu Cable Network. A “nudge” from N.Ram, Chairman, The Hindu Publishing Group, Chennai broke the silence over suppression of content by these illegal and illegitimate methods; this led to conversations in the media on the Arasu Cable’s suppression of “inconvenient” content; The Hindu wrote an editorial on June 23, 2018 about the decline of media freedom in Tamil Nadu; NDTV carried a debate on the attack on media freedom in Tamil Nadu on June 23, 2018. Several sections of the media community in Tamil Nadu met for an event entitled, “A Media Consultation: Rights and Responsibilities” at Quaid-E-Milleth International Academy of Media Studies, Chennai on July 1, 2018. The event saw the coming together of media organizations such as The Hindu, The Times of India as well as journalists’ organizations such as the Foundation for Media Professionals (FMP), the Network of Women in Media (NWMI), Centre of Media Persons for Change (CMPC). A cross-media advocacy and action group called “Alliance for Media Freedom” was formed to monitor the state of media freedom and deal with situations of suppression through legal and democratic means. This show of a bit of solidarity made the government of Tamil Nadu take notice of the development. The event was widely covered by The Hindu, Daily Thanthi, The Times of India, BBC Tamil, The Wire, The Hindu Tamil Thisai and other media organizations. The consultation was followed up with a meeting of a delegation with Mr Edappadi K.Palaniswami, Chief Minister of Tamil Nadu on July 10, 2018. 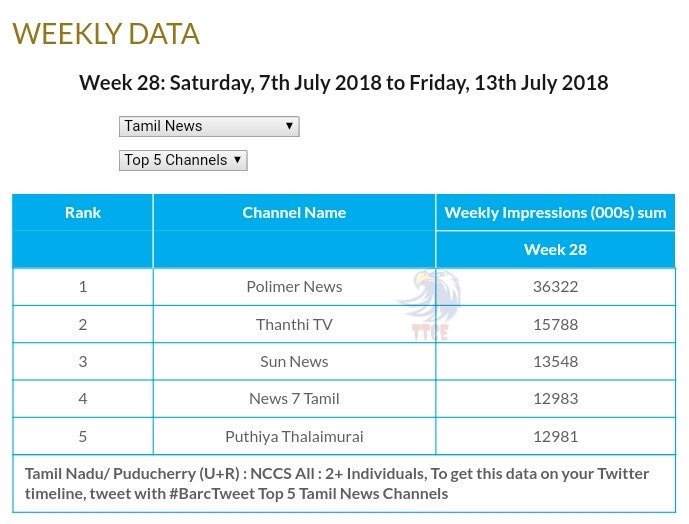 Hours before the July 10, 2018 meeting of the Alliance for Media Freedom with the Chief Minister Edappadi K.Palaniswami, Puthiya Thalaimurai TV channel was restored to 124th position on Arasu Cable TV from the 499th position; News 7 was restored to 137th position from 168th position on Arasu Cable TV. Interestingly, News 7 was pushed down for coverage of protests against eight lane expressway between Chennai and Salem. This had happened in the second week of June. Instances of blackout of news channels have reduced after the meeting; Kalaignar Seithigal team has confirmed this development. The managements of Sun News, Makkal TV and Sathiyam TV have also confirmed the same. There have been arbitrary district-level blackouts of Kalaignar Seithigal, Sun News earlier (before the formation of Alliance for Media Freedom). Other TV channels including Captain TV have joined the alliance now. The news TV channels have realized that coming together will be of some value. The following charts from the Broadcast Audience Research Council (BARC) published in the last three weeks show how Arasu Cable’s intervention has reduced in the week after the formation of Alliance for Media Freedom. Both Sun News and Puthiya Thalaimurai TV are back in the competition after the formation of the alliance. 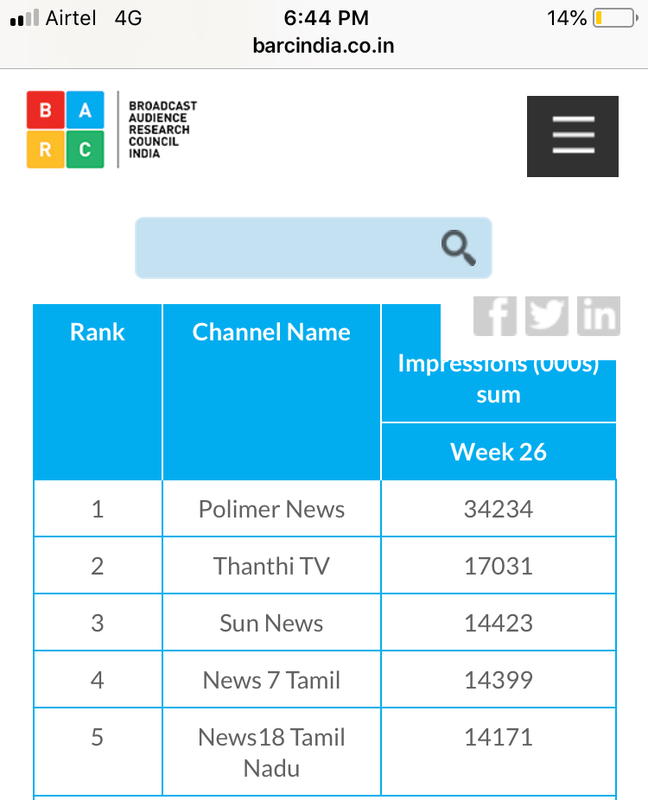 Sun News was not in the top 5 chart of news channels for few years; Puthiya Thalaimurai is back after two weeks of non-existence in the top 5 chart. The coming together of sections of media helped Sun News get back to the race. The appearance of solidarity in the media community helped Sun News get back to the competition. The unity among sections of media helped Puthiya Thalaimurai get back to the public after few weeks of oblivion. How India’s flawed policy led to the loss of over 300 lives?